For many of us whose interests arose from rock music, the first encounter with what came to be called non-idiomatic improvisation was ECM 1005, The Music Improvisation Company. Trying to reconcile the instruments listed with the sounds coming out of the speakers was baffling to say the least, especially for ears not attuned to abstraction and the expanded techniques employed to produce these noises. There were sounds that gave the impression of being strings, was that the guitar, and other sounds which might conceivably be termed percussion, but I heard nothing which sounded like a saxophone and what the hell was meant by live electronics. Derek Bailey later opined that he was assiduously avoiding any use of open strings at that time, so it was a bit disconcerting that some of Hugh Davies' homemade contraptions were essentially nothing but an open string. For all that though, the most mysterious element was the voice. I decided the singer must be recorded so poorly as to be drowned out in the mix. I heard Ovary Lodge around this same time, also quite abstract but Julie Tippetts' vocals had an expressive quality that made them quite recognizable, whereas Christine Jeffrey eschewed anything that smacked of emotion, and blended with the other timbres so well that it made one doubt there was any voice present. In retrospect I can pick her out quite easily, but at that time the recording seemed very mysterious. A sticker affixed to the cover of View from Six Windows features a laudatory blurb by Anthony Braxton, terming Bailey "The most amazing guitar player on the planet" and opining that he and his music are "one of the most significant contributions to creative music (and world creativity) in this time period". 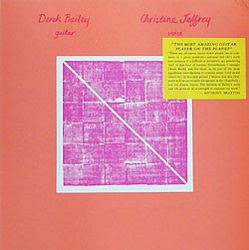 Of course Derek Bailey is very well documented on recordings, the same cannot be said for Christine Jeffrey however. It was only when View from Six Windows was released in the early '80s that I was at all certain which noises Jeffrey had been making on the MIC album. View from Six Windows is the perfect vehicle for Jeffrey with only Bailey's acoustic guitar, and on one track a ukulele, for accompaniment. Bailey is at his sparest and most pointillist on View, which allows one to hear clearly what Jeffrey is doing. At times the timbres and spaciousness of the recording even recalls the biwa, shakuhachi duet of Takemitsu's Eclipse. This is a recording whose dynamic range and delicacy cries out to be heard on CD, but it's never been reissued, so this at times somewhat noisy rip shall have to do for now.